I swear, there are no bananas in this recipe! And I just lied. You might need a machine for this, just not an ice cream maker. Ours broke and at this point I think that we probably don’t need a new one. I found a perfect replacement. It’s our high speed blender. “Those vegans and their fancy blenders!”, some of you might think now. And you are right. These gadgets are wickedly expensive and not essential to whatever you are making in your kitchen. But please don’t click away just yet. I have included a popsicle recipe you can make with a couple of pans, a hand held blender or food processor, and a freezer. (If you don’t have a food processor or hand held blender either, you can replace the walnuts with some nut butter of your choice.) Simply pour the ice cream batter (recipe follows at the bottom) into glasses, ice cube or popsicle molds, let them sit in the freezer for about 1 – 2 hours, insert some sticks and let the popsicles firm up completely. Just that simple and quick! There’s just one little caveat: Whatever anybody tells you, ice cream popsicles are not the same as ice cream. They will still be nice and refreshing, but they will not be perfectly smooth and creamy. They will be a little bit crunchy as some of the liquid will form large ice crystals during freezing. Since nobody is churning anything here, these crystals can’t be kept from forming and there’s no additional air stirred into the batter. But if you keep all this in mind, I think you will not be disappointed with these walnut caramel popsicles. After all they are a sweet treat, perfect for a warm spring day. And look at that hand model above. I got P. to help me with my pictures and hold that ice cream. But I am digressing. For a perfectly smooth and light ice cream, you can either use my blender method, or you follow David Lebovitz’s instructions. For that you’ll need a hand held blender and a shallow container. If you want to follow my method, here’s how: You simply freeze your ice cream until solid. Then you cut it into cubes, about 5 x 5 cm (2 x 2 inches), place it in a high speed blender that is capable of doing this hard job. Then you blend on high until your ice cream has the consistency of soft serve. After that you put it back into the freezer and let it firm up. This will result in an ice cream that has exactly the same texture as if it was made with an ice cream maker. To be honest, it’s not only the blending method that makes for a good texture. I’ve experimented a lot and I used to think that fat was the most important ingredient to achieve a creamy texture. Well, sure, but it cannot do the work alone. In the past I would pair it up with a thickener and binder, such as guar gum. But that is not necessary and if you use too much, you’ll just end up with a box full of frozen slime. 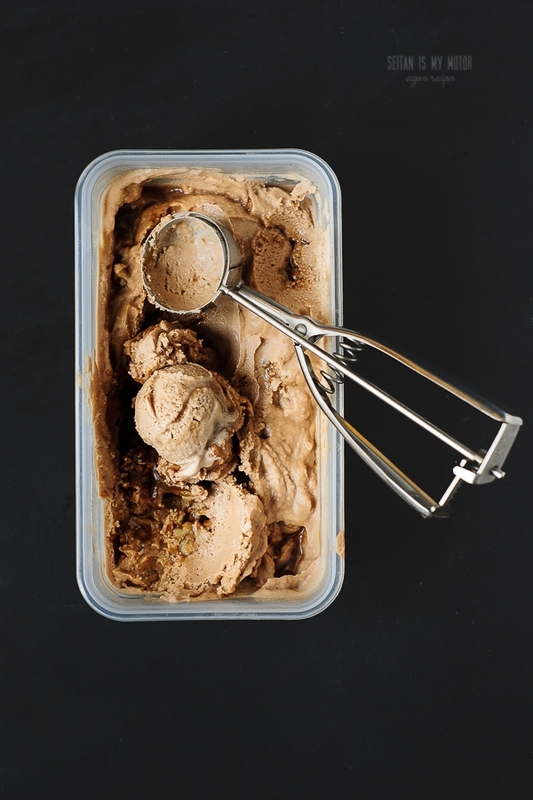 There’s a much better ingredient for creamy and perfect to scoop vegan ice cream. And no it’s not a bunch of healthy bananas. It’s plain old sugar. (If you like bananas in your ice cream, please go ahead and use them! I freeze and blend some myself once in a while. I am not against frozen bananas. Just don’t make me believe a frozen banana pudding is the same as ice cream.) While you mix your batter, the sugar dissolves and during freezing much of it remains unfrozen. So if your ice cream is rock hard after a couple of days in the freezer, that might mean going low sugar is not always an option. This recipe has lots of sugar and there’s a little extra trick making things even easier. With more sugar. 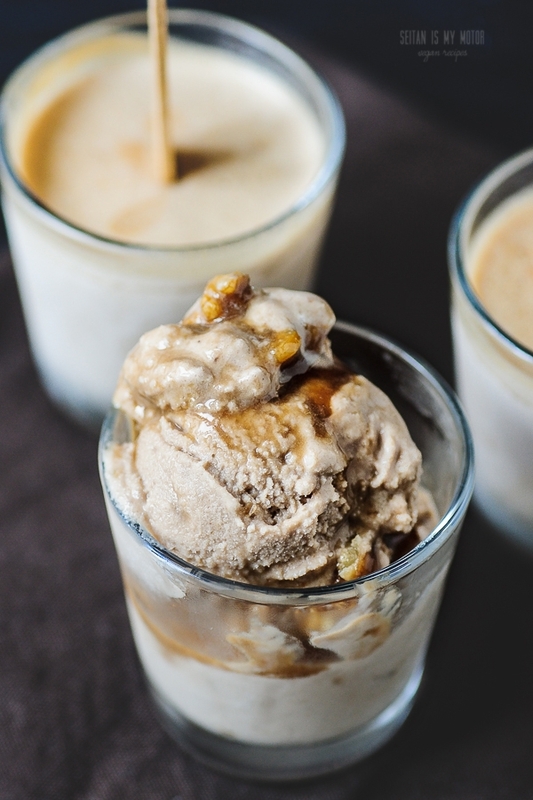 If you add some caramel to your ice cream, it will improve the texture even more. That is, as long as you can abstain from eating it. (I managed a whole week. But that was only because I was sick.) And isn’t caramel ice cream just the best? A couple of notes: For the ice cream pops you won’t need the whole batch of caramel. You can reserve it and serve as a sauce. (Keep in mind that the sugar will crystalise after a day or two though.) Yes, this ice cream calls for coconut milk. Coconut ice cream is great, but personally I don’t want all my vegan ice creams to taste like coconut. And since I am sure that some of you are with me here, I did my best to mask the taste. Of course, you have to judge for yourself, but we couldn’t detect any coconut flavour in this batch. I divided this recipe and used it both for the blender and the popsicle version. It’s embarrassing, but I cannot tell you how many popsicles this makes. The whole recipe yields about 6 cups. My glasses held about 1/3 cup. Thar means half the recipe should make about 9 popsicles. 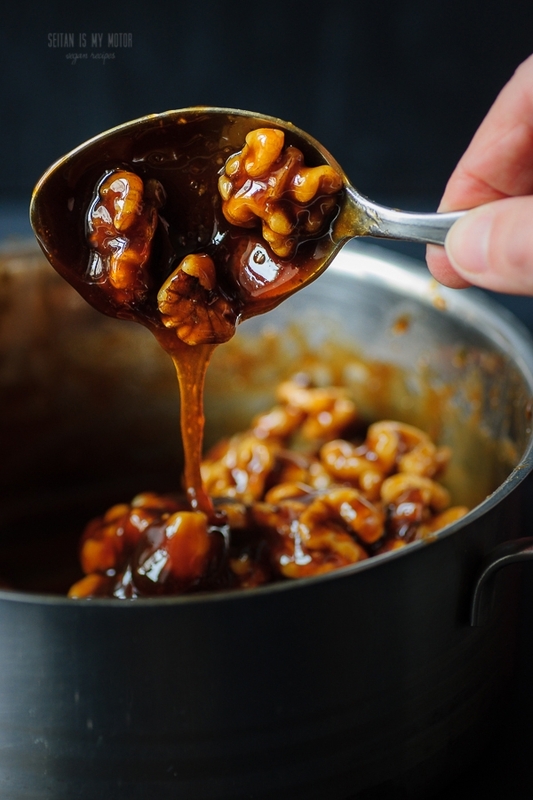 To make the caramel, combine sugars, agave nectar, and water in a small saucepan. Heat carefully while dissolving the sugar. Stop stirring immediately once the mixture starts to boil. Remove from heat, stir in salt and coconut milk, bring back to a boil and simmer for another 15 minutes. Remove from heat, stir in walnut pieces, set aside and let cool completely. To make the ice cream, combine milks, arrowroot, and salt in a saucepan and mix well. Bring to a boil and cook for one minute. Pour the remaining caramel in the pot with the milk. Stir until the caramel has dissolved. Add oil and vanilla (to taste), and process, until the mixture is creamy and all walnut pieces are pulverised. 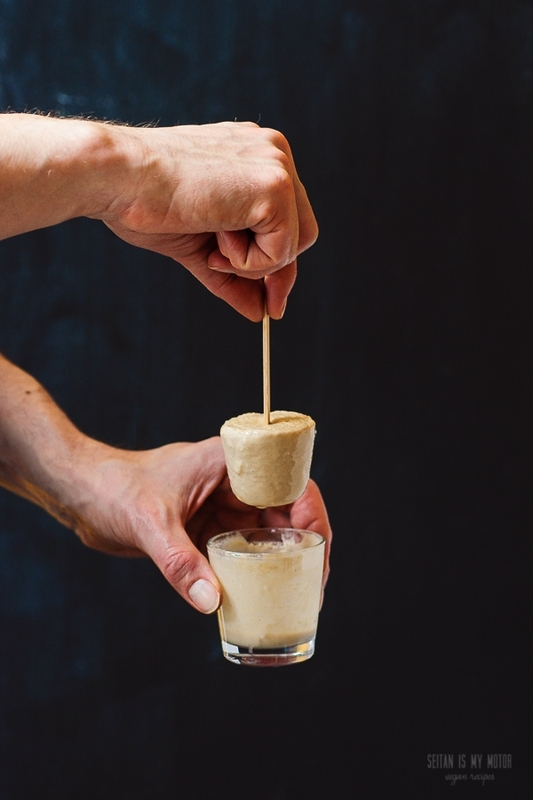 If you are going for the popsicle version, simply pour the batter into shot glasses or popsicle molds and freeze until the batter is stiff enough to hold wooden sticks. Insert them and place in the freezer again until completely solid. If you are going for the blender version, pour the liquid into a freezer suitable container and freeze until solid or over night. Cut into small cubes, about 5 x 5 cm (2 x 2 inch) and place in a high speed blender. Blend until your mixture has the consistency of soft serve. Make sure not to overprocess or your ice cream will melt and you have to start over. Transfer to the container, then to the freezer and freeze for another hour or so. Now pour the remaining caramel over the ice cream and quickly fold it in. Don't blend it completely, you are aiming for swirls. Freeze for a couple of hours, or until firm. This sounds wonderful….but can you help me find a supplier of vegan white sugar please as I have been finding it difficult? Or could I use all brown sugar in this recipe? This looks DECADENT, I’m so hungry now!! You are an evil genius. Thanks for your amazing/thoughtful posts and delicious recipes. As for the high-speed blender thing – do you think a moderately good food processor would do the trick? I’ve made fruit sorbet with it several times and the blade seems to be pretty powerful to chop through frozen strawberries. I am not sure. Even if it’s strong enough, would it hold the whole portion so you can blend in one session? Otherwise you could split it up in portions, see how it goes with the first batch and place everything you have blended in the freezer immediately. I don’t think I am a genius but I’ll take the evil part. This looks so creamy and beautiful! Wow, this looks super delicious, and thanks for sharing your ice cream tips! I’m also not a fan of everything tasting like coconut (or bananas) but I often add it for creaminess. I feel like my ice cream tends to need a lot of sugar to taste good anyway, so it’s good to know that it helps the texture too. Seems to work really well – it’s a totally gorgeous looking ice cream. Very inviting in this new warmer weather. 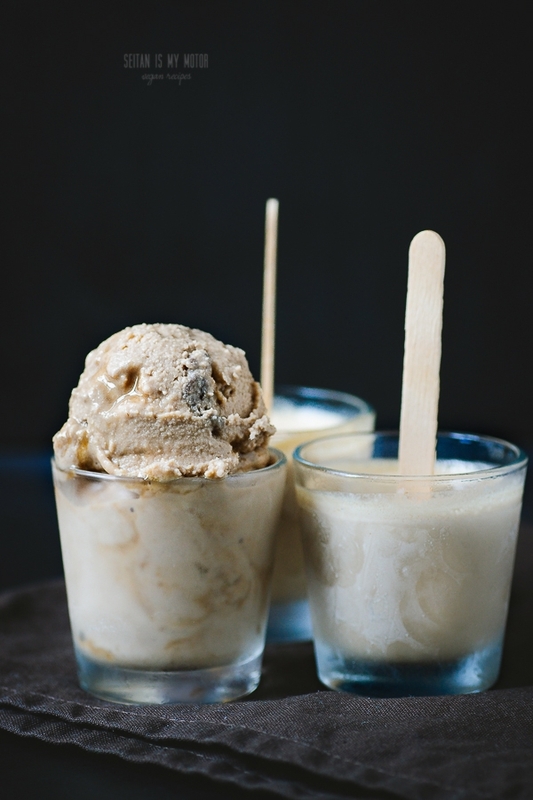 Oh this looks great and I think I need to try your method of ice cream now I have a good blender – I tried the hand held blending every hour once and almost went batty – so this sounds better. I agree with you about ice cream – alcohol also is meant to be immune to freezing but I usually share my ice cream with a small child so sugar will have to do.